Japan�s Sumitomo Heavy Industries is investing EUR20 million in the facilities of Sumitomo (SHI) Demag Plastics Machinery in Schwaig and Wiehe in Germany. The investment will allow the company to modernise production systems for injection moulding machines. According to SHI, aside from modernising the facility with new processing machines, the main item in the most recent investment concerns buying back the property and buildings of the sales and works site in Schwaig. Explaining the background to the property buy-back, the company said the previous owner Madison Capital Partners had sold the properties to the real estate company Segro in 2008. Since then, the company has been renting the properties from Segro. The main Demag facility in Schwaig produces its hydraulic Systec machines and hybrid El-Exis machines. In 2009, after SHI acquired Demag, the Wiehe facility was expanded to become an international centre for electric machines. 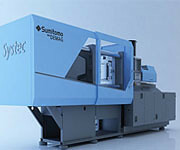 Wiehe supplies the IntElect series of electric injection moulding machines to worldwide customers.